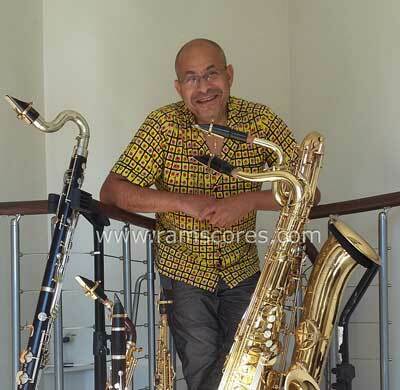 Ronald ALPHONSE (saxophones, flutes, clarinets) worked with Demis Visvikis, Maria Schneider and Laurent CUGNY. He played with (among others), or with Yuri BUENAVETURA, Orlando POLEO, Ralph Tamar, Mambomania, Peter KING, Pierrick PEDRON, Yvinec, CHOCOLATE, Jerry Gonzales, Veronika Rodriguez, Florence DAVIS, John Meyer, Zool FLEISCHER, Cynthia Scott, Nancy Kelly, Cab CALLOWAY'' Junior'', Paula WEST, Linda Lee Hopkins, vocal jazz quartet UPTOWN, Michel HAUSSER, Michael CIVISTA, Claire Martin, Tony Marshall.. He has performed in a lot festivals in Europe (first part of James BROWN in Estoril in 2000. His last CDs:Melodic lines (2013) Moods of THELONIOUS (2008).